august dental marketing – Hayden Consulting – Where Your Success in Business and Life Matters! The Back to School season, while dreaded by many children, and some parents and teachers too, it is a great time for your dental office to exceed patient expectations and educate the community on the importance of good dental health for their children as well as for teachers. Theme: Back to School With Healthy Smiles! Social Media & Blog Posts with Dental Health Tips for Children. Have special offers just for Teachers and Students during the month. Send a Press Release and Social Media Posts focused just on Kindergarten aged children as August is “Get Ready for Kindergarten” month. Here are 5 More Ways to Help your Team and Patients Smile in August! August 6th – National Fresh Breath (Halitosis) Day ~ Excellent Blog and Social Media Educational Post Opportunity! As well as service/treatment opportunity in the office. August 10th – S’mores Day ~ Patient Appreciation Gift “We Need S’MORE Patients Like You. Thank you for your referrals!” label that includes your office information, attached to a mini s’mores kit. See my Pinterest board for ideas. August 20th – International Tongue Twister Day ~ Share some tongue twister riddles on your social media pages. If you liked this article, please let me know by giving it a “like”. Also, feel free to comment below with any other marketing ideas for the month of August that you’d like to share. Be sure to take a second and subscribe to receive in your email inbox each month, my FREE dental marketing and practice management ideas. Wishing you all a Very Successful and Happy August! Cancellation/Missed Appt List – Do you have any patients on these lists that can be called? Take a tour of the office and look for any areas that could use some improvements. See Tips to Improve your Office – First Impressions and Tips to Improve your Office – Make a Change for ideas. I hope these ideas provide you with a quick fix to fill those holes in your schedule. Let me know how they work for you. While we are still very much enjoying summer, as a mother of two school aged children I’m forced to start working on our Back to School to do list. The Back to School season is a great time to market to and educate the community on the importance of good dental health for their children as well as for the teachers. What: Back to School With Healthy Smiles! Facebook & Blog Posts with Dental Health Tips for Children. 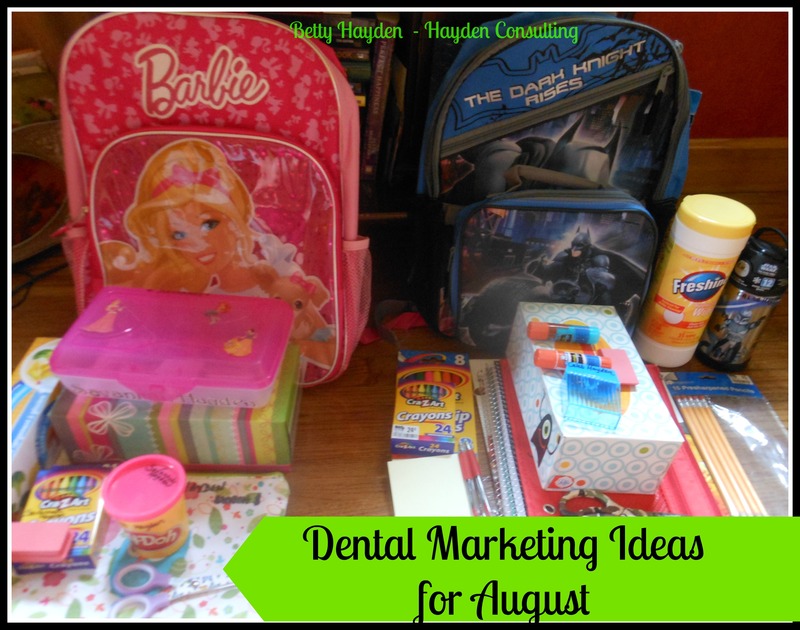 Here are 3 More Ways to Help your Team and Patients Smile in August! Happiness Happens Month ~ Find ways during the month to make your patients and team happier!! August 8th – Sneak Some Zucchini Onto Your Neighbor’s Porch Night. (I’m serious, it’s a real day!) While you probably don’t want to visit your patient’s homes during the night you can easily have a basket of zucchini at the office for your patient’s to take. Wrap some ribbon and a business card with a zucchini recipe on it for your patients to sneak onto their neighbors porch during the night. August 16th ~ Hug Your Boss Day! Or just take them to lunch… and if that’s too much simply give them a heartfelt thank you for being such a great boss. I’m confident they will truly appreciate it! Please share with me any other ideas you may have! Also, be sure to subscribe to receive in your email inbox each month my free dental marketing and practice management ideas.